Taco fans, rejoice! Not only is it Taco Tuesday, but it's also National Taco Day. Celebrate the holiday with these taco deals all around D.C.
District Taco announced on Instagram that anyone who makes a video of themselves yelling "I love District Taco!" in public and posting it on social media will receive a free taco. Just tag District Taco in your video and show it to the manager at any D.C. location. District Taco just asks that no one yell in the actual restaurant. ABC Canteen announced via Twitter on Tuesday that you can get four tacos for only $8 all day in honor of National Taco Day. Taco lovers can choose from chicken, fried cod, chorizo and more. Agua 301 Restaurant will be upgrading their happy hour on National Taco Day with $2.50 tacos from 5 p.m. until closing. Their happy hour also regularly offers margaritas, flatbreads, guacamole and other Mexican dishes. 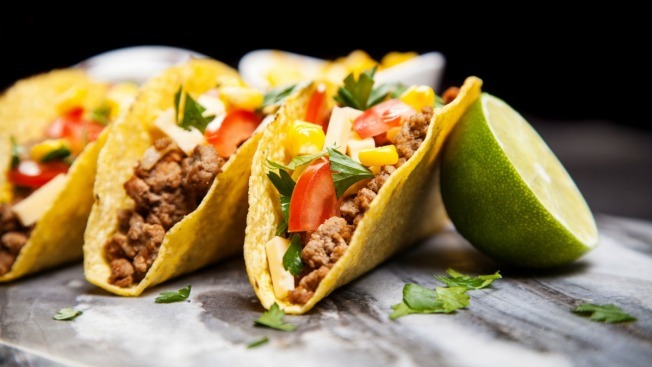 Fuego Cocina y Tequileria always celebrates Taco Tuesday, meaning you can enjoy two tacos for just $5 not just on National Taco Day, but also every week. Choose from chicken, shrimp, chorizo, veggie and more. This restaurant chain will be offering 50-cent mini-tacos all day in participating restaurants. You can choose from beef, chicken tinga, or veggie. Feel free to order as many mini-tacos as you'd like -- there's no limit! California Tortilla will be offering buy one, get one free tacos all day long for National Taco Day. They have locations all over D.C., including in Cleveland Park, Verizon Center/Chinatown, Bethesda and more. If you're craving late-night tacos, check out Don Tito's in Arlington. This restaurant offers a weekly Taco Tuesday special with half-off tacos on their rooftop lounge in addition to hookah, cocktails and a DJ starting at 9 p.m.
El Chucho might not be celebrating National Taco Day, but they do celebrate Tequila Tuesday. They're offering 20 percent off all tequila and mezcal all night. It must just be a coincidence, but Republic Taco launched their breakfast taco delivery service Tuesday via UberEats. Users can now order a breakfast taco to be delivered daily from 8 a.m. to 11 a.m. to start their day off.